More and more businesses are shifting their work online because it is fast and convenient. It provides ease to clients by eliminating the need of keeping record of thousands of files or papers. It significantly cuts down the cost of purchasing papers or other equipments, and also made the storage and transfer of files easier. But, with shifting of business online, some security threats may also come along. In the process of transfer of file from one system to another, it passes through a number of networks or systems, which generates a possibility of information leakage. 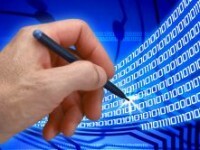 The best way to avoid any such possibility and to make the data secure is, the usage of an e Signature software. E Signature authenticates an e document like a signed paper document. It also encrypts the document that can only be decrypted by the receiver, thus there is zero possibility of information leakage. For making the whole process simpler, many e Signature softwares are available online and they are offering pretty good features. Just take a look at them. 1. These softwares are easy to use and can complete the whole process of sending files within few clicks or just within minutes. 2. These softwares allow clients to manage or edit their online documents from any remote location or away from office; this makes the whole process really convenient. 3. Sending paper documents is a costly, hectic and time consuming process. 4. The most important reason of choosing e Sign software is security. With this software there is almost zero possibility of information leakage. No one else can access the data apart from the authorized receiver. Now, as we have seen some of their important features, it’s the time to understand their working process. They work in a really simple manner. Only four simple steps can explain the whole functioning, so take a look. 1. First step includes uploading of online document and personalizing it before sending. 2. After personalizing, add recipients and send the documents to them to get the sign done. 3. Receive the signed documents from multiple parties. 4. Now save and send the documents to the receiver for information sharing. E Signature software not only simplifies the whole process of sending and receiving documents, in fact it also makes sure that there would be no security threat to your confidential information. These signatures can be very helpful for organizations that share confidential data, transaction details or any other important information online. E Signature software plays amajor role in assuring the security of important data that resides online. It is easy to use and offer some really useful features. You can also buy one for yourself online for ensuring the security of data, because many websites are offering highly reliable e Sign softwares.